Google has quietly expanded its list of censored search phrases with the addition of music streaming service Grooveshark. The piracy blacklist was introduced to curb copyright infringement and prevents popular keywords from appearing in Google’s Instant and Autocomplete services. On precisely what grounds Google decided to censor Grooveshark is unknown at this point. There are certain words Google doesn’t want its users to see without explicitly searching for them. Type in the first letters of any private body part, cuss word, or a non traditional sexual orientation and you’ll notice that Google holds back the most obvious and most searched for suggestions. For more than two years Google has been applying the same moral compass to filter “piracy-related” terms from its Autocomplete and Instant services. This means that “the pirate b” returns the suggestions below, resulting in a significant dip in search traffic for this term. After the initial announcement, Google expanded the filter occasionally and most recently the music streaming service Grooveshark was added to the list. The addition of Grooveshark is noteworthy because Google has received relatively few DMCA takedown requests for the Grooveshark domain. Google explained earlier that these requests are one of the factors used to determine whether a search phrase should be filtered or not. Grooveshark, which operates from the U.S., has more than a million visitors per day and has negotiated licensing deals with several independent music labels. The major labels, however, have not licensed their content to the company, which has resulted in several lawsuits. 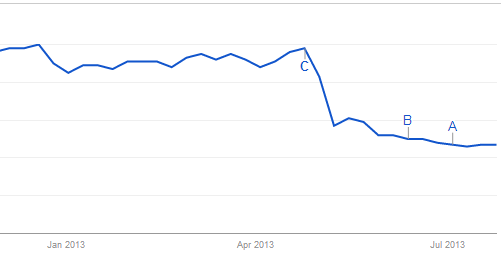 Looking at the search traffic for “Grooveshark” it appears that the term was put on the blacklist at the end of April, coinciding with the appeal Universal Music Group won against the streaming service. TorrentFreak asked both Google and Grooveshark for a comment on our findings yesterday, but both have yet to respond. Previously the search giant told us that they are adding terms that are linked to piracy, based on several factors. “We are removing terms from Autocomplete where we find that those terms are closely associated with infringing results,” a Google spokesperson said. “When evaluating terms for inclusion, we examine several factors, including correlation between the term and results that have been subject to valid DMCA takedown notices,” Google added. To us it seems likely that the addition of Grooveshark is not based on algorithms or DMCA requests. Google is asked to remove a median of 12 Grooveshark URLs per week, compared to 1,792 for BTloft, which is not on Google’s piracy blacklist. Perhaps the music labels have been pushing for Grooveshark’s inclusion behind the scenes? 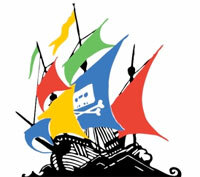 Besides censoring piracy related terms, Google also began downranking ‘pirate’ websites in its search results last year. Although we’ve seen some changes in the search results, the effects of this update don’t appear to have had a dramatic impact. Perhaps the most worrying of all is the lack of oversight and transparency, two factors that are not unimportant when it comes to filtering of allegedly “infringing” content. c There are 167 comments. Add yours?